BOSTON – Prime Minister Alexis Tsipras will be going on Wednesday (2/6) to the Theological School of Halki to meet with Ecumenical Patriarch Bartholomew. Initially, the Greek Prime Minister’s visit will commence with a trip to Ankara, Turkey to meet with Turkish President Recep Tayyip Erdoğan. The next day Tsipras will fly with his counterpart to Constantinople and from there to the island of Halki where Patriarch Bartholomew will be officiating the Feast Day of St. Photios, patron saint of the Halki Theological School. Mr. Tsipras will attend the Liturgy, the reception, and luncheon. After dining, he will hold private talks with Patriarch Bartholomew. Alexis Tsipras is the first Greek Prime Minister after Eleftherios Venizelos in 1933 who will visit the famed Theological School of Halki. Recently, in Athens, Tsipras declined to receive a Patriarchal Delegation to discuss church-related matters, such as clergy compensation. Prime Minister Tsipras and the Archbishop of Athens had a preliminary agreement in place to change the process with which the clergy is salaried. However, neither the Archbishop nor the Prime Minister notified either the Holy Synod of Church of Greece or theEcumenical Patriarchate. Under its canonical and ecclesiastical jurisdictions, The Patriarchate is at the helm of 36 Metropolises of the New Lands, the Metropolises of the Dodecanese, the Semi-Autonomous Church of Crete and the clergy on loan from Greece who are serving in the Metropolises of the Ecumenical Patriarchate in Europe. The clergy that are loaned from Greece get compensated from the government of Greece. Tsipras offered Patriarch Bartholomew to send the Minister of Education with the Secretary General of the Ministry of Education and Religions but the Patriarch replied negatively. Sources of The National Herald in Athens, and at the Ecumenical Patriarchate, told us that Archbishop Ieronymos exerts a lot of influence on Mr. Tsipars regarding the latter’s decisions on Church matters. Ieronymos last October refused to accept a visit in Athens by Ecumenical Patriarch Bartholomew. The Holy Theological School of Halki is located atop a hill called the Hill of Hope, on the island of Halki, one of the Princes’ islands. It is approximately a one hour boat ride from the shores of Constantinople. On the grounds of the School is the monastery of the Holy Trinity which was founded during the Byzantine period, though the exact date of its establishment is unknown. The reestablishment and reconstitution of the monastery are associated with the Ecumenical Patriarchs Photius I the Great, Metrophanes III, and Germanos IV. Germanos IV (1872-1845) visited the monastery in 1842 and saw the School’s reconstruction and reconstitution which was approved by the Turkish authorities. On the 1st of October 1844, with a special ceremony to mark the occasion, the operations of both the Holy Monastery and the Theological School were resumed. The building which originally housed the Monastery was a wooden structure. It contained rooms for the professors, classrooms, an infirmary, administrative offices and Patriarchal quarters. The library of the school was housed in a nearby two-floor stone building. Unfortunately, on June 28, 1894, an earthquake completely destroyed all the facilities except for the church. The devastating earthquake led to a halt of the school’s operation. The Holy Monastery and the Theological School of Halki owe its current form to the contribution made by the benefactor Pavlos Skilitsis Stefanovik. He charged the architect Periklis Fotiadis with the design and construction of the new facilities which took the form of the Greek letter Π (pi). The school’s complex is comprised of a basement, a ground floor and two stories. The inauguration took place on October 6, 1896, after which point, school was back in session. During the 1950s modifications were made to the complex in order to satisfy new needs and requirements. New contemporary fixtures for bathrooms, central heating, kitchen, and cold storage were installed; the entire roof was repaired, the infirmary and the administrative offices were reorganized. During this same period, numerous repairs were made to the monastery’s church. The school’s buildings are surrounded by gardens whose aesthetic design and creation were overseen by Metropolitan Dorotheos of the Princes’ Islands. Behind the altar of the Monastery’s church, and in a special location, just beyond the garden , one can find the graves of past Patriarchs, bishops and teachers of the school. The Theological School of Halki was primarily founded to meet the educational needs of the Church of Constantinople and of Orthodoxy in general. Other contributing reasons for its creation included: the renaissance in learning which occurred during the 19th century, the need for ecclesiastical and theological instruction of the orthodox clergy, the orderly and systematic cultivation of theological knowledge, the need to confront Western ideologies with an anti-Christian bias, such as materialism and socio-philosophical systems with rigorous argumentation, and finally, the need to confront the proselytization efforts that were being conducted by Western Christian denominations at the expense of Orthodoxy. 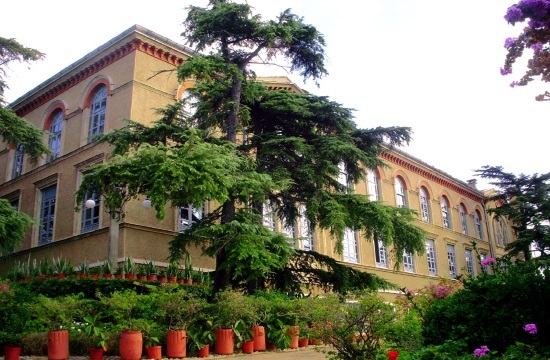 The history of the Holy Theological School of Halki, from its establishment in 1844 until today, can be split into five distinct periods: From 1844 to 1899, the school had seven grades: four high school-level and three theological grades. From 1899 to 1923, the high school division was dissolved and the school functioned as an academy with five grades. From 1923 to 1951, the old seven grade system was restored. From 1951 to 1971, the school had seven classes. There were three courses at the high school-level and four theological grades. In 1971, the School was closed according to a law that was promulgated by the Turkish government which prohibited the operation of private institutions of higher education. Thus, since 1971, despite occasional promises by the Turkish authorities, the school has remained closed. However, the Orthodox faithful and friends of Orthodoxy the world over can visit the school and under a recent initiative of Ecumenical Patriarch Bartholomew, international ecological conferences and seminars have been hosted at the school.